Although little is known about the clandestine cargo hidden inside the rocket's nose cone, the type of Atlas performing the launch is clear. 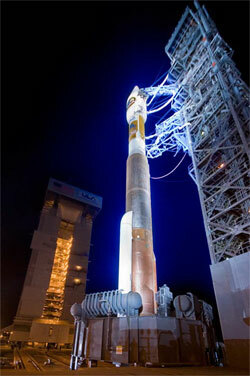 It is the unusual Atlas 5-411 vehicle with a single solid-fuel booster mounted to the first stage. For this particular payload, no solids wouldn't get the job done and two boosters would be too much. One solid is just right. The rocket flies smoothly despite the uneven appearance because the solid booster's thrust is aligned with the Atlas 5's center of gravity and the dual-nozzle RD-180 main engine provides remarkable steering control. You can follow the countdown and liftoff with complete live updates throughout the evening in our Mission Status Center.